Before Northwestern takes the floor Thursday afternoon at the Wooden Legacy, it’s important to know the standards that govern the NCAA’s Thanksgiving-week tournaments. A school can’t participate in the same one more than once in four years. There can only be one team per conference per tournament. And the programs with the highest profiles tend to get into the most prestigious events. Ever since coach Chris Collins was hired in 2013, the Wildcats (3-0) have been trying to get into a major 8-team tournament during Thanksgiving week, but they couldn’t find a match until this year’s Wooden Legacy. NU was one of four teams in 2017’s Naismith Memorial Hall of Fame Tip-Off and 2016’s Legends Classic — the team finished in second place both times. Over the last two years, the Cats played power-conference teams on ESPN2 in the championship games, but director of basketball operations Chris Lauten said they have been constantly vying for a bid in an even more high-profile event. In this year’s Wooden Legacy, NU will take the court three times, including two possible games televised on ESPN2 against potential opponents like Miami, Seton Hall and Utah. Coach Chris Collin draws a play. The sixth year coach’s squad will play in an eight-team Thanksgiving week tournament. The journey to Fullerton, Calif. has been a long time coming: it began all the way back in 2015, when Lauten started having conversations with the Wooden Legacy’s organizers. After having barely any regular season games televised on the ESPN networks, Lauten was presented with the chance to give the program a type of exposure it hadn’t really had before. 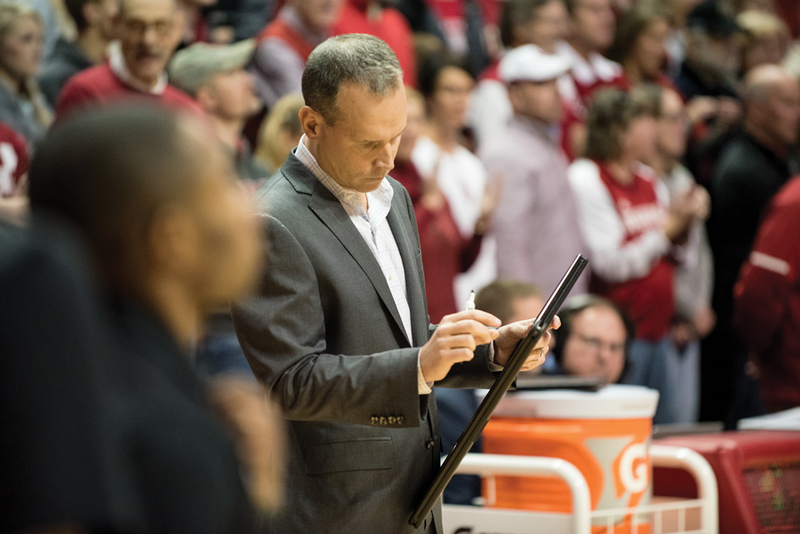 When Jeff Fellenzer was running one of the biggest early-season college basketball events on the calendar, he never selected a program with the profile of NU. In 1997, Fellenzer founded the Pete Newell Challenge, an annual four-team showcase in multiple California cities that honored the Hall of Fame coach and featured some of the country’s best programs. Over its ten-year lifespan, Fellenzer recruited high-profile schools including Duke, Stanford, Kansas and Gonzaga to participate, as well as ones with west-coast ties like California and Nevada. Back then, it wasn’t as daunting a proposition to get the Blue Devils or the Jayhawks to come to California for the weekend. For the fourth year of the Pete Newell Challenge, Fellenzer scheduled a matchup between the Blue Devils and the Cardinal at Oracle Arena in Oakland. When the game took place on Dec. 21, 2000, it ended up being a top-three matchup. Tiger Woods — at the height of success — made the trip to support Stanford, his alma mater, and watched the game with 19,803 other spectators. It remains the highest attended regular season college basketball game in California and the definite high-point for Fellenzer’s event. ESPN had televised events like the Maui Invitational and the Great Alaska Shootout since the 1980s, but in the early 2000s, the network decided to invest heavily in new marquee tournaments taking place during Thanksgiving week. That investment had ramifications for Fellenzer and other organizers of early-season challenges and tournaments. It evolved from a “mom-and-pop industry” into one of ESPN’s biggest networking properties, and the Pete Newell Challenge ended in 2006 in part because Fellenzer couldn’t competitively recruit programs anymore. Over the last ten years, ESPN has helped elevate the status of events like the Battle 4 Atlantis, the Wooden Legacy and the AdvoCare Invitational by offering basketball programs much-needed exposure. Now, the network serves as a matchmaker between different programs and their tournaments. In 2017, ESPN and Nike partnered to create the one-time PK80 Invitational, which brought together 16 of the most high-profile Nike-sponsored schools in the country and was the most popular tournament last year. It was a sign of the network’s influence and a bigger event than anything Fellenzer — now an associate professor at the University of Southern California — had ever imagined. After all, the Pete Newell Challenge ended because programs had a difficult time rejecting ESPN. The man behind the Wooden Legacy also oversees 10 other college basketball events, 13 football bowl games and ESPN’s season-opening college football showcases every Labor Day weekend. Clint Overby, the vice president of ESPN Events, makes dozens of connections every year between an aspiring school and a Thanksgiving basketball event. Between Nov. 15 and 25, ESPN will broadcast nearly 90 total games, and many of those on ESPN and ESPN2 will feature powerhouses like Duke, Villanova and Kansas. Over the ten-day stretch, 12 games featuring top-ten teams will occur on the network. Over the past few years, the Cats have been trying to find their own place in this part of the college basketball universe. According to Fellenzer, NU should be willing to participate in ESPN’s events for the exposure alone since it’s more likely for a potential recruit to stumble across one of these games than a mid-week conference tilt on the Big Ten Network. While programs like Duke can command the highest fees and be invited into virtually any tournament it wants, Overby said he doesn’t yet see the same value in the Cats. Since only one team from each conference can participate in a tournament annually, NU is competing against the biggest programs in the Big Ten for few spots. When ESPN decides in the offseason which Big Ten games to flex from Big Ten Network onto its primetime, it looks at the same factors that influence which schools end up in which Thanksgiving tournaments. Michael Wilbon and Tony Kornheiser banter in front of a group of Northwestern students. PTI’s Welsh-Ryan broadcast — among other recent opportunities — have bolstered Northwestern’s prospects for future appearances on ESPN. NU hasn’t played a game on the flagship ESPN channel since Jan. 2016, a 76-45 home loss against Denzel Valentine and the Michigan State Spartans. 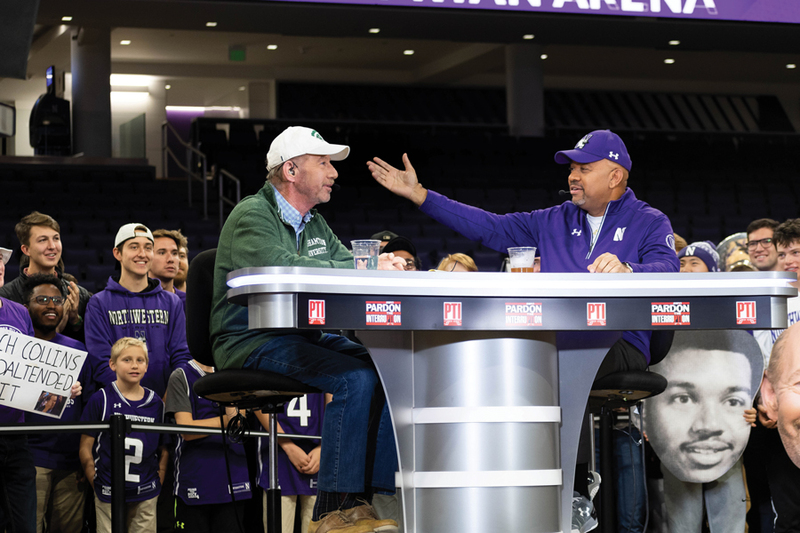 But Lauten sees participating in the Wooden Legacy and hosting a live taping of Pardon the Interruption at Welsh-Ryan Arena as positive signals. In the meantime, NU likely won’t be playing in the Maui Invitational or the Battle for Atlantis in the near future for the same reasons it doesn’t get primetime Saturday games on ESPN. The Cats leave for Fullerton on Tuesday, more than three years after Lauten started planning for the Wooden Legacy. 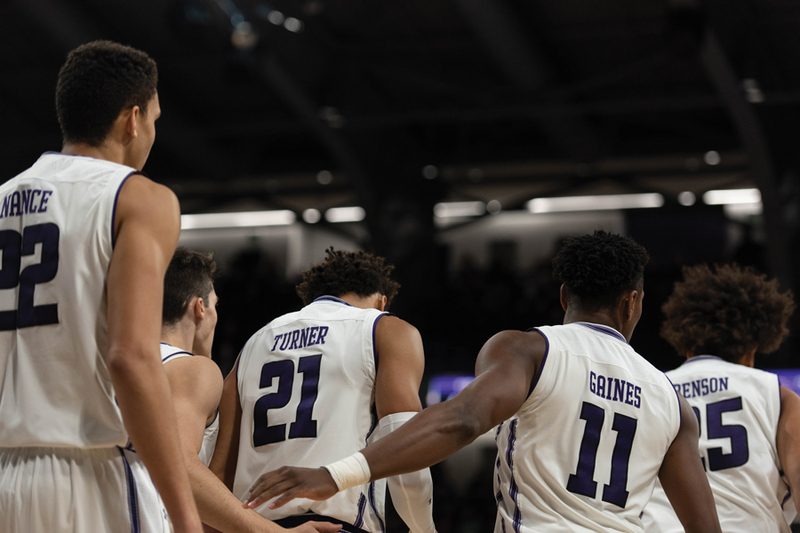 In Nov. 2019, NU has scheduled an appearance in the four team Fort Myers Tip-Off and will compete against Kansas State, Bradley and an undetermined fourth team, according to CBS Sports’ Jon Rothstein. Even though it’s not as high-profile an event as fans might be hoping for following the Wooden Legacy, Lauten said a number of additional factors influence this sort of decision. This week’s games project to be some of the best-rated ones the Cats will have all season, as all but one of their conference games — a February home matchup against Minnesota — will air on the Big Ten Network or Fox Sports 1. Of course, NU will have to earn its way onto ESPN2 by winning Thursday as the opening game of tournament against Fresno State; all of the consolation games air on ESPNU or ESPN3. If the Cats win Thursday, they’ll face the winner of Miami vs. LaSalle in the second round and then potentially Seton Hall or Utah in the championship game. If they come up short, they’ll move into the losers bracket and miss out on a chance to showcase a team Collins has been praising since the preseason. For NU, the Wooden Legacy is an opportunity to prove its ability to compete in a surprisingly strong Big Ten. Overby will be watching in Fullerton, looking to see what progress the Cats have made.